« Theophany. Why was Christ baptized? Concerning Holy Water. 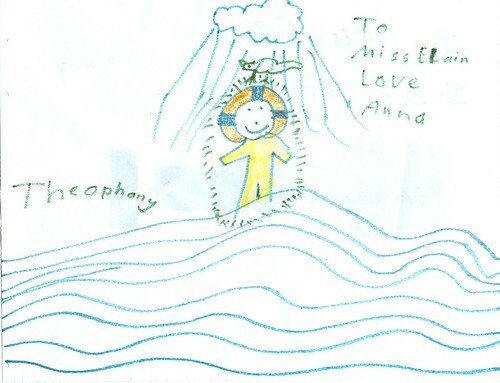 Theophany from a child’s eyes. I think this is a pretty accurate representation, don't you? Okay, maybe the smile is not accurate, but all children draw their icons with people smiling! Would we want it any other way? This entry was posted on Wednesday, January 19th, 2011 at 10:47 pm and is filed under Feasts Of the Savior, Theophany (Baptism of the Lord. You can follow any responses to this entry through the RSS 2.0 feed. You can leave a response, or trackback from your own site. I understand why icons are written without depicting smiling faces (although I have seen a few icons of the Theotokos and Christ child–[e.g. 'Sweet Kissing'] where there seemed to be a slight smile on the lips of both Mother and Child.). I understand the reason for this tradition. But, in real life, I am not so sure there was not a smile, like the one in this child's sweet drawing, on the Savior's face, when the Holy Spirit descended and the Father said "This is my beloved son….."
Icons contain the gaze of divine wisdom which is joy, and, though we sometimes see the wisdom that has come from sorrow. But a child's icon remains child-like in the wisdom of simplicity, thus, Jesus, Mary, the saints, smile. There really is no contradiction. Father Seraphim, my daughter Antonia, seven years old, and I think the picture is adorable and nice and so cute. I relate more to the “man of sorrows” part of Christ’s life. I smile a lot when I see my silly dog, or play with my grandchildren, but I never really forget how terrible things are for so many, and how I am blessed to have a small part in helping them.